For Milton, our countless walks throughout the neighborhood are more like hunting exhibitions. He delights in yapping at clusters of birds as they up and fly away. Squirrels, also known as tree rats, are favorites to dash after in fast pursuit. As one can imagine, I am always the bothersome tag-a-long who never moves quite quickly enough for Milt to seal the deal and grab his prey. He probably thinks if I wasn't always holding him back, he would be fully able to feed our little family of three. I happen to disagree, but then again I am the one who constantly gets my arm yanked out of socket as he lunges to consume. Has the Milt Dog ever succeeded in luring, trapping, and catching a rodent? Well, no, but recently he did "tree" something new while at the land with Pop. 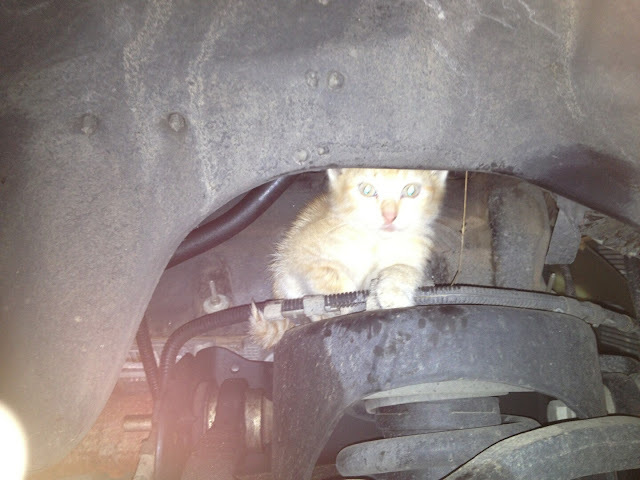 This teeny tiny kitten, that most likely belongs to a neighbor, has been squatting on Pop's land. 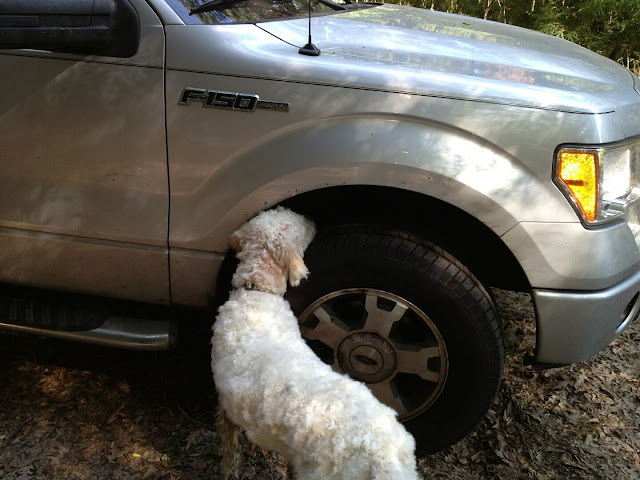 Milt Dog was quite intrigued by the little girl despite holing her up under the truck fender. I think the poor dear was just a little bit hungry as is evident by her crawling into the Milt's bowl. Did our goldendoodle pounce and attack such an easy target? No. He is just a gentle giant at heart, and if you catch him at just the right moment, he is even capable of sharing too! Poor kitten. 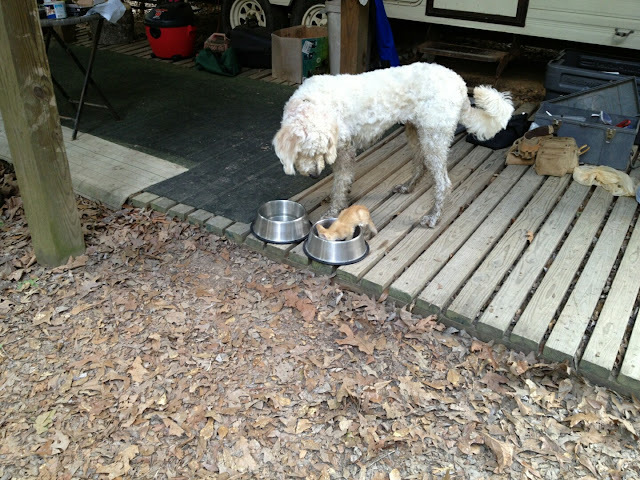 Pop says that when the kitten saw the food it forgot its fear of Milton. so sweet! he's a lover not a fighter! Milton is such a sweet dog! Thanks, Ting! We are just wild about our boy.